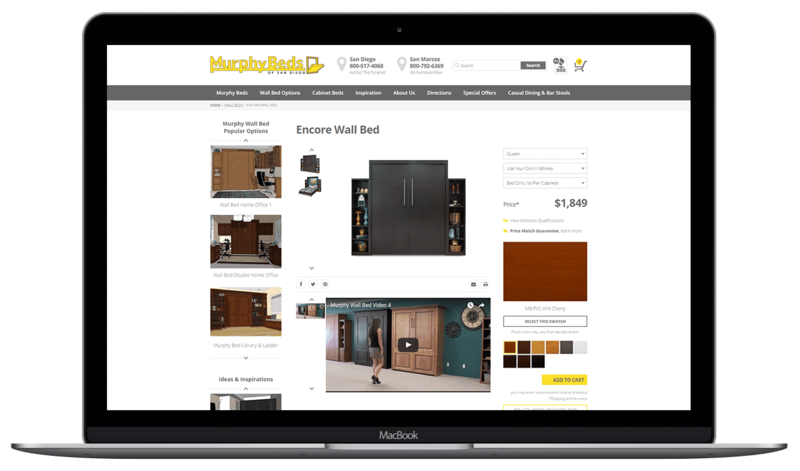 WordPress Website, Murphy Beds - NOYO Web Development Inc.
NOYO Web Development Inc. amazed us with their ability to create custom solutions for our e-commerce platform. The real value was their WordPress expertise. What you won’t find anywhere but at Murphy Beds of San Diego is their custom design service. Sure, prefabricated wall beds are readily available, but only at Murphy Beds of San Diego will you realize the ability to imagine any type of wall bed and watch your dreams turn into reality. They can design a custom Murphy wall bed system around your unique lifestyle needs. No matter how much space you have to work with, or how it is configured, they have a custom solution. Do you want bookshelves and filing cabinets to accommodate your home office in a space as small as a closet? They can do that! How about storage for your kids’ toys and stuffed animals while adding a bed for their sleepover pals? Maybe your living room needs to serve double duty as a guest room so you want a cabinet bed that holds a TV or full entertainment center. They can do all this and more. Custom Murphy beds are configured with your choice of lighting, hardware, seating, power supply, and side piers with various functions. Choose the style of your wall bed or CabinetBed – everything from traditional to contemporary – along with finish, bed size, and mattress type.